Briniah Torres never visited the Great Falls. When her school took a field trip to the Great Falls National Historical Park last week she was amazed to find such a place existed in her hometown. “It’s a beautiful view,” said Torres, 9, looking at the Passaic River from Mary Ellen Kramer Park. She was not alone. Of the more than 100 students on the field trip from School 15 more than half had never visited one of America’s newest national parks. 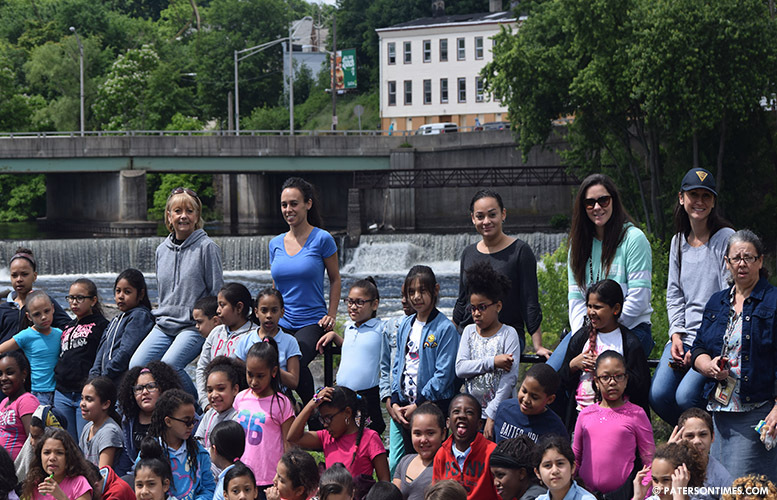 “I had never seen a waterfall,” said Lizbet Martinez, 8. She would like to one day return to the park for a picnic with her sister and watch the 77 feet high waterfall. “Did you know this is one of the most beautiful waterfalls in the country and it’s in your backyard?” asked her teacher, Sevgi Gilroy. Martinez shook her head in the negative. Torres’ father, Luis Torres, said he visited the park numerous times. “I never brought her up here. There’s nothing much to do, but look at the water,” he said. Gilroy was surprised to find many of her students had never been to the Great Falls. Faith Ann Hodges, a social studies teacher, a native Patersonian, was shocked. “They live less than two miles away,” said Gilroy, an English teacher. “With all the mills closed people are not aware of what went on here,” said Hodges. There are also other reasons why many have not visited the Great Falls. Some fear walking to the Great Falls, she said. Games at the Hinchliffe Stadium attracted families from all over the city to the area, said Hodges. With the stadium in disrepair that route has been long closed. There’s also the neighborhood factor. Those who live in the Hillcrest, Totowa, and Stony Road neighborhoods are extremely familiar with the Great Falls; however, those from far flung neighborhoods like the Eastside, Wrigley Park, and South Paterson sections are not. Residents often stay within their neighborhoods and sometimes visit the downtown area. The city’s different sections are almost different little towns. More and more schools are taking field trips to the park, said Boch. For years, the park has been working with School 5 and School 7. There’s also a general lack of awareness of national parks in minority communities. Boch said youngsters from Paterson are being exposed to the National Park System. He noted the trips hundreds of youngsters from the city took to the Morristown National Historical Park and Joshua Tree. This fall, more local youngsters, fourth graders, will head to the Ellis Island through the Every Kid in a Park program, he said. The students from School 15 were all 3rd and 4th graders. Fourth grade is the best year to capture a child’s imagination, said Boch. They are just old enough to appreciate the sights, but not old enough to ignore it. The students visited the park to learn about the environment. They also cleaned up Mary Ellen Kramer Park by picking up bottles, cans, and bags. The Passaic Valley Sewerage Commission provided the students with gloves and 50 garbage bags. The Great Falls attracted 177,000 people from all over the country and the world in 2016. There's SO much history in PATERSON people are not aware of, that's a very good idea for the school system to expose city kids to all that history. Whos the butter face in the blue?